Forecasters are warning of a high risk of wildfires after one blaze burned 10,000 hay bales in the southwest part of the state. Kansas Gov. 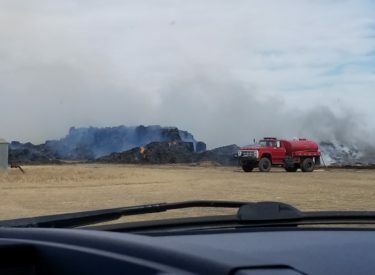 Jeff Colyer signed an emergency disaster declaration Sunday when the large bales burned a half mile north of the Stevens County town of Moscow amid wind gusts of up to 50 mph. This year’s fire season follows two years of record setting wildfires. Kansas Division of Emergency Management spokeswoman Katie Horner says the “lesson learned” from previous years is to mobilize people quickly to prevent fires from getting out of control. Before the bale fire was contained, crews were on standby with planes equipped with large buckets capable of dumping water. Extreme dry conditions will continue to create dangerous conditions Monday.